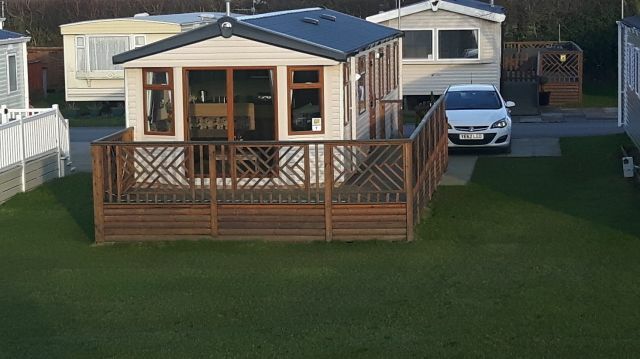 This Swift Burgundy Special 35 ft x 12 ft caravan with full central heating is a modern open plan design and sleeps up to 6 people in 3 bedrooms (1 double and 2 twin). Wall mounted TV in each of the twin rooms. The spacious lounge provides ample comfortable seating with electric fire, 32" flat screen LCD Freeview TV with DVD/CD player to play all your own personal media. There is also a digital media player with a large selection of various movies to suit all tastes & age ranges. The fully equipped kitchen includes gas cooker with grill, fully integrated fridge-freezer, microwave, toaster, kettle, pots/pans, crockery, cutlery and all cooking utensils. Tea towels are also provided. Fire extinguisher, smoke alarm, carbon monoxide detectors and fire blanket are all provided for your safety. The shower room consists of a shower, hand basin and towel ring. Please bring your own hand/bath towels. The separate toilet also has a hand basin. All bedding is provided, all beds are made up for your arrival, giving you the freedom to start your holiday from the moment you arrive. Outside a large decked patio area complete with table/chairs and BBQ overlooks a grassed children's play area, ideal for keeping an eye on your children while you chill out. Gas and electricity are all included in the price.